Seeing a pink elephant is commonly associated with being inebriated, making this bespectacled cocktail-sipping pachyderm a fitting, albeit still extremely strange liquor store mascot. 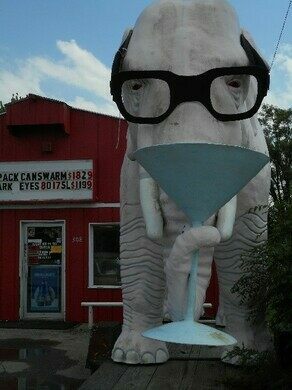 Outside Elite Beverages in Fortville, Indiana, the giant pink elephant sits on an aging wooden cart, wearing black-framed glasses slipped down the bridge of its nose, with its trunk wrapped around the stem of a martini glass. 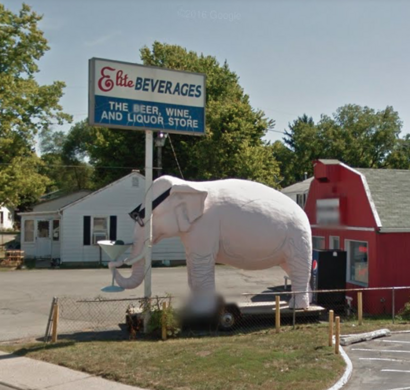 At 12 feet tall and 19 feet long, the elephant has been headquartered in front of the barn-like liquor store since the 1980s. Its glasses and the olive in its martini have occasionally been stolen, but townsfolk also like to add things, particularly around the holidays. The elephant has been bedecked in Christmas, Pilgrim, leprechaun, and Uncle Sam garb depending on the time of year. It has also been known to attend local parades and festivals. To top it off, at a nearby restaurant and ice cream parlor called Indulge, the elephant has been honored with an ice cream concoction called the Pink Elephant featuring strawberry ice cream, soda, whipped cream, and rock candy, all served in a martini glass. Update: As of fall 2018, the pink elephant is currently not standing, as the owner of Elite Beverages at 308 W. Broadway St. has torn the original building down to make way for a new and improved venue. 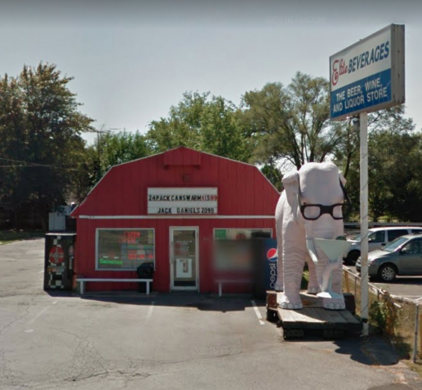 It should return to its previous location by April 2019, and the owners are also looking to name the giant bubblegum-colored pachyderm.